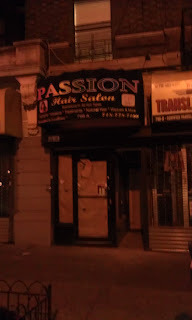 More to come on this later tonight, but for right now, the word is out that 736A Franklin Avenue, the former home of about About Time Boutique (and The Spot, if you go way back), will re-open soon as a sandwich shop. ILFA is thrilled, both because Kevin and Garnet Philip are awesome people whose businesses are community lynchpins, and because ILFA absofreakinglutely loves sandwiches. About Time's designs are still available online, and based on the photo, the new shop has all the excellent style we've come to love. No word on the opening or offerings yet, but watch this space for more info. We'll be out cleaning the Garden this Sunday from 12-5 if you want to come weed, clear out rubble, share ideas, have fun outside, and help plot out the new raised bed design. Bring gloves, heavy duty trash bags, and kids if you've got em! We could also use a pick ax and sledge hammer if you have that too. We did it! Our Kickstarter is now fully funded! 59 backers, 7 days. Wow. This ensures that we’ll be able to receive funds. BUT you can still encourage others to donate until May 18th. The more funding the better. More importantly, the more volunteers the better! We're looking for donated plants (maybe you have some to divide at home? ), soil, mulch, and0 tools so keep your eyes peeled (whatever that means). Also we're hunting down friends, friends of friends, or even frien-emies who may have pick-up trucks and vans if you know of anyone. Check out this great event from the SOS Crown Heights team this Saturday at St. Marks and Kingston, and mark your calendar for their Arts to End Violence Festival, which is coming up in May. Please join us at our first S.O.S. 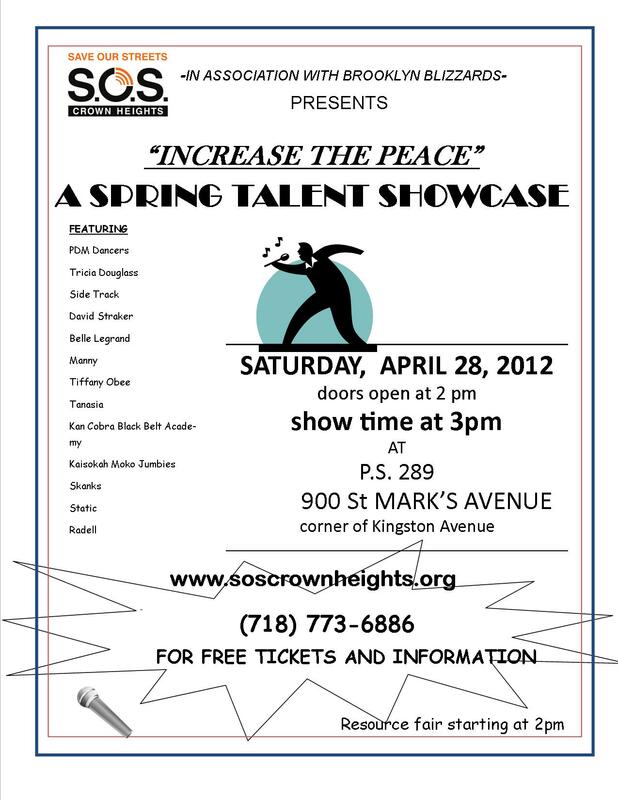 Crown Heights "Increase The Peace" Talent Showcase. The S.O.S. Team and Anthony Newerls of Brooklyn Blizzards have worked over the past several months to secure the best talent that either reside or attend school within the S.O.S. 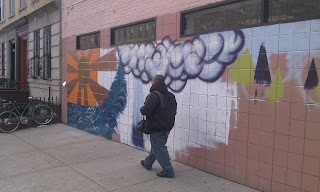 Crown Heights target area and who are dedicated to promoting positive messages with their talents. There is a broad spectrum of talent from poets to dancers, singers to martial artists; we promise you will enjoy and leave wanting more! All performers are winners, there will be no judging. Join us to show your support for these positive young performers. This is a free event. Please call our office at 718-773-6886 for tickets. P.S. Be on the lookout for our "Arts to End Violence Festival," May 19th-24th, a community generated art show and family festival, and S.O.S. Week, June 2nd-June 10th, during which we will have our annual March to End Gun Violence. Movie night with the Kings County Cinema Society returns to LaunchPad tonight with a very special party to help build momentum for the production of "Medora," a fascinating look at the collapse of small-town America amid deindustrialization and depopulation. 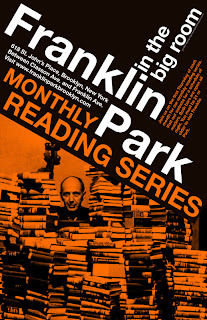 Check them out on Kickstarter even if you can't make it (but do make it - it's BYOB and they've got free popcorn!). Kickstarter party for Davy Rothbart and Andrew Cohn's doc MEDORA, now in production. Learn more about the kickstarter campaign and check out an extended preview. Director Andrew Cohn will also present a quick short short, "Little Helper" shot next door to Launchpad at J's Wong restaurant on Franklin Ave.
"Years ago, Medora was a booming rural community with prosperous farms, an automotive parts factory, a brick plant, and a thriving middle class. The factories have since closed, crippling Medora's economy and its pride. The population has slowly dwindled to around 500 people. Drug use is common, the school faces consolidation, and as one resident put it, “This town's on the ropes.” ... Medora follows the down-but-not-out Medora Hornets varsity basketball team over the course of the 2010 - 2011 season, capturing the players’ stories both on and off the court. The Hornets were riding a 44-game losing streak when we arrived, often playing schools ten to twenty times its size. The team’s struggle to compete bears eerie resonances with the town’s fight for survival in a country whose economy has shifted away from farming and manufacturing. Medora is an in-depth, deeply personal look at small-town life, a thrilling, underdog basketball story, and an inspiring tale of a community refusing to give up hope despite the brutal odds stacked against them — we like to think of it as a real-life, modern-day Hoosiers. On a grander scale, it’s a film about America, and the thousands of small towns across the country facing the same fight. Followed by the recent verite doc October Country (dir. Michael Palmieri, Donal Mosher, 2009, 80min) a verite look at an American family haunted by the ghosts of war. Filmed in upstate NY. 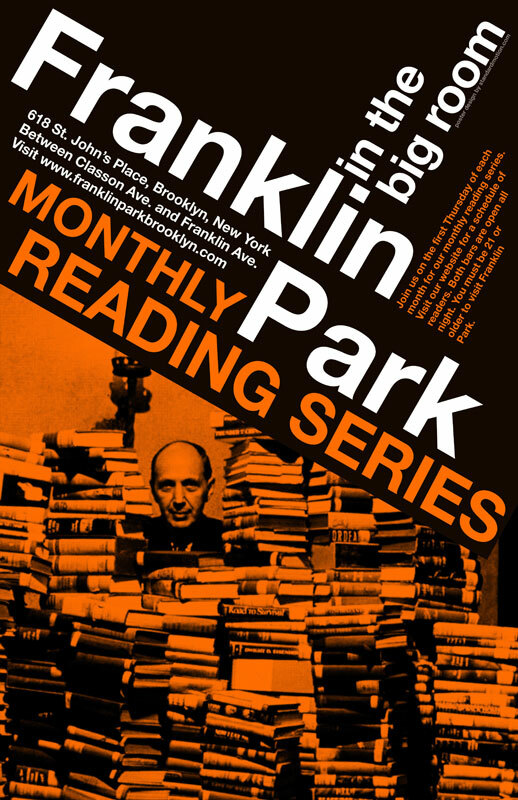 At LaunchPad: 721 Franklin Ave btw Park and Sterling Pl. 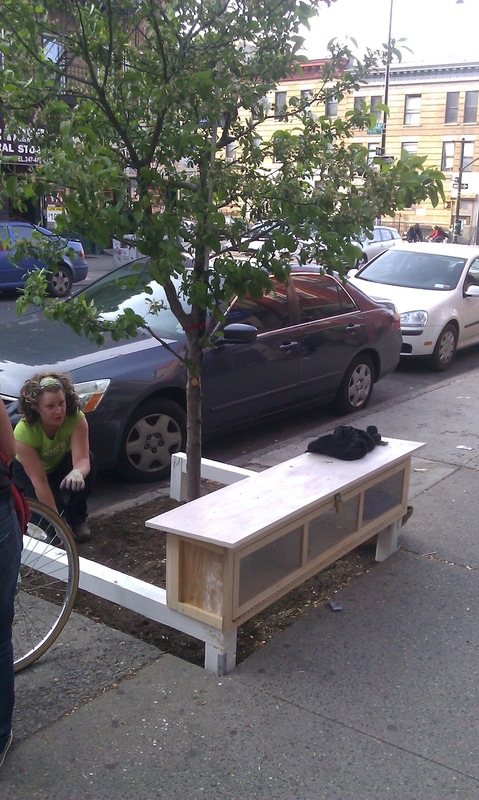 Lots of great people are working to make Crown Heights beautiful this spring. 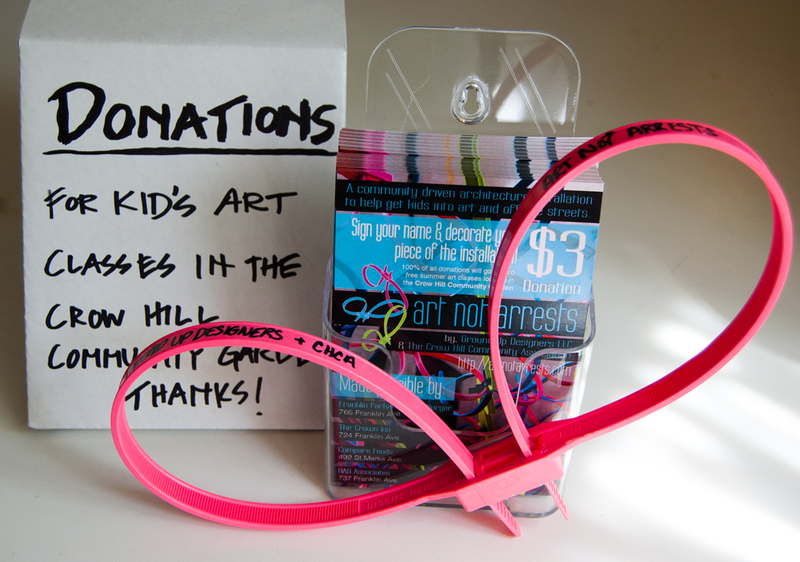 Also, if you're one of the many members of the creative underclass here in Crown Heights, Art Not Arrests is still seeking teachers for summer art classes (and if you're a parent, they're seeking students of all ages, too). Either way, get in touch with them if you'd like to be involved! Meanwhile, over on Rogers and Park, the Roger That Garden Project has been working to transform the lightly-cultivated community garden on that corner into a completely co-operative space for growing food and having fun. They've launched a Kickstarter to help make their vision a reality, which is almost funded but could always use a few more donations to get it over the hump (check 'em out on Tumblr, too). Finally, out in front of LaunchPad, construction of a bench-based gardener's library, which will contain tomes on gardening and cooking as well as seeds to share, is almost complete. Come fly away with us! Edouard Steinhauer is a Haitian-American artist whose use of of found and transformed objects in his work pushes the limits of medium and the imagination. His current multi-media installation entitled “In No Strange Land” pays homage to John Hampton’s “The throne of the third heaven of the nations’ Millenium General Assembly” located at the Smithsonian Institute in Washington. In Steinhauer’s interpretation of Hampton’s shrine, the aluminum-wrapped components become electricity conductors. 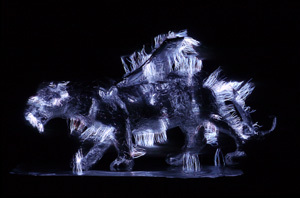 Using 4×5 analong film process, Steinhauer captures the ethereal electric charges. Large prints of these images are up on display. The second work in the installation is a series of kinetic sculptures composed of common household appliances and furniture that rotate, begin and stop seemingly at random. The audio component to this installation is comprised of low frequency beats produces with synthesizers and keyboards. In a review of “In No Strange Land,” André Juste cites the “magical beauty- and even the mystery- in the show lies in its transparency of means.” The use of consciously distinguishable elements in Steinhauer’s work only adds to the power of the mystical aura that seems to surround his composed pieces. The effect is an intriguing straddling of the real and beyond. Join Haiti Cultural Exchange for a discussion with Edouard Steinhauer about his present and past work, use of medium and his inspiration. His current exhibition will also be up for view. Also, check out André Juste's review here. Seating is limited, please RSVP to regine@haiticulturalx.org. This event is free but we do ask for a suggested $10 donation. The Crow Hill Community Association meets tonight at 7:30pm in the Gospel Tabernacle Church at 725 Franklin Avenue. The meeting promises to be a fascinating one - here's their announcement. First we will have a meet & greet with the 77th Precinct, this will include officers from the command as well as the Impact Zone. This is a great time to get any NYPD related questions answered especially if it is hard for you to attend the 77th Precinct Community Council meetings. 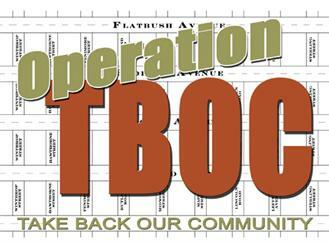 Next we will have a working meeting to start organizingOperation TBOC in Crow Hill. We have been talking about the TBOC initiative at our last few meetings and now we are ready to start organizing: block by block. This is a program that is designed to provide community members with the tools to take control of “quality of life” issues in their community. If you are interested in being a part of this exciting and important community project, come to April’s meeting ready to get started. NB: Even though our "official" borders are between Franklin & Bedford, if you live between Franklin & Classon we want you to join us!!! If you can’t attend or would like to learn a bit more about the program in advance, we have posted the outline for you to download. Jean Renoir famously asked, "Is it possible to succeed without any act of betrayal?" Not according to authors HEIDI JULAVITS (The Vanishers), TOURE (Who's Afraid of Post-Blackness? ), FIONA MAAZEL (Last Last Chance), JOSEPH RIIPPI (A Cloth House) & LEAH UMANSKY (Barrow Str...eet), who'll share tales of backstabbing colleagues, frenemies, unfaithful lovers and sinister machines in a shocking "Night of Betrayal"! TOURE is an American novelist, essayist, music journalist, cultural critic, and television personality based in New York City. His most recent book is a collection of interviews and essays, Who’s Afraid of Post Blackness? He is also the author of the essay collection Never Drank the Kool-Aid, the novel Soul City, and the short story collection The Portable Promised Land. He is the host of Fuse's Hiphop Shop and On The Record and an MSNBC contributor. His writing has appeared in Rolling Stone, where he is a contributing editor, TIME Magazine, The New Yorker, The New York Times, The Believer, and other publications. His work has also been featured in several anthologies, including The Best American Essays, The Best American Sportswriting, and The Da Capo Best Music Writing. FIONA MAAZEL is the author of the novel Last Last Chance. She is the winner of the Bard Prize for 2009 and a National Book Foundation "5 Under 35" honoree for 2008. Her work has appeared in Bomb, Bookforum, The Common, Conjunctions, Fence, The Mississippi Review, The New York Times Book Review, Tin House, Salon, n+1, and The Yale Review. She lives in Brooklyn, and her second novel, Woke Up Lonely, will be published by Graywolf Press in the spring of 2013. JOSEPH RIIPPI is the author, most recently, of the novella A Cloth House and poetry chapbook Treesisters. His novel Do Something! Do Something! Do Something! was published in 2009, and his story collection, The Orange Suitcase, was released in 2011. 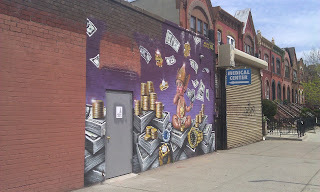 His work has appeared in a wide range of venues, including The Collagist, BOMB's Word Choice, Tin House Flash Fridays, Pank, Elimae, NANO Fiction and The Brooklyn Rail. A Seattle native, he now lives with his wife in New York City. LEAH UMANSKY is a New Yorker by birth, a teacher by choice, and an anglophile at heart. Her first book, “Domestic Uncertainties,” is floating around contest piles and hoping for someone to say, “yes!” She received her BA in English/Creative Writing from SUNY Binghamton and her MFA in Poetry from Sarah Lawrence College. She has contributed to the BOMB Magazine and Best American Poetry blogs and reviewed poetry for The Rumpus. Her poems have appeared or are forthcoming in Barrow Street, Contemporary Verse 2, Cream City Review, The Paterson Literary Review, Magma Poetry, and elsewhere. She blogs at iammyownheroine.wordpress.com and is the host and curator of COUPLET: A Poetry and Music Series on NYC’s Lower East Side. 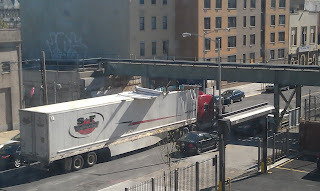 They might not be multi-million dollar projects, but these new additions to the Avenue will certainly be here sooner. 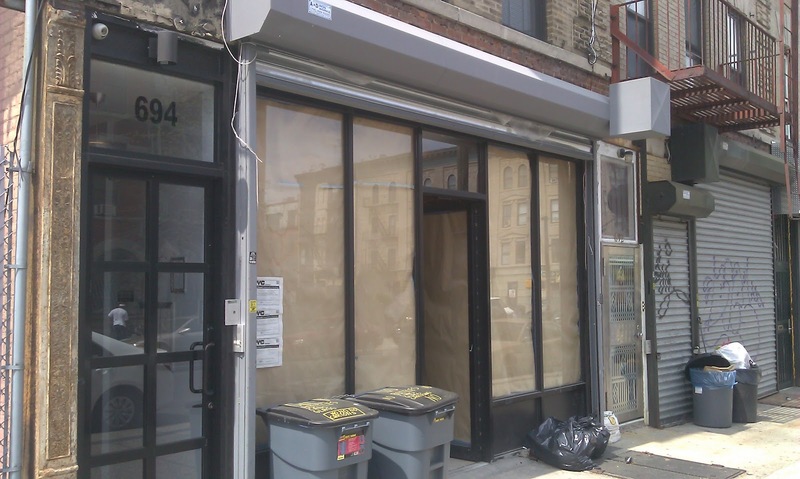 At 694 Franklin (between Prospect Place and Park Place), Excelsior Cycles, a spacious new bike shop from the folks who own Ninth Street Cycles in Park Slope, is slated to open May 1st. Meanwhile, the permits on the building at the southwest corner of Franklin and Sterling are for a conversion to an "eating and drinking establishment." There've been some closings, too, of course - over on Park Place, the only thing that remains from the star-crossed Pawn Shop is the hotly-debated mural. - Art Not Arrests assembled their canopy this weekend in the Crow Hill Community Garden. Check out the video/photo montage above for an inside look at the process. - Mike Woodsworth has a moving tribute to civil rights leader and longtime Crown Heights resident Elsie Richardson, who passed away last month at the age of 90, in The Nation. Crown Heights isn't often remembered as a hotbed of civil rights struggle, but leaders like Ms. Richardson were instrumental in improving and preserving the neighborhood at a time in its history when neither the city nor private industry was doing much to keep it from ruin. Those of us who enjoy a comfortable life amidst the beauty of Crown Heights today have leaders like her to thank for their efforts. Among the many campaigns Ms. Richardson was involved in was the founding of Medgar Evers College, a dynamic living reminder of the civil rights legacy in Central Brooklyn. - The Brooklyn Yoga Cooperative, currently based at LaunchPad, has grown so tremendously that they'll be moving into their own space two blocks south (in the former hairdresser's spot, next to the dollar store between Lincoln and St. John's, I believe) sometime soon. - Speaking of LaunchPad, they'll be launching a Game Night on April 21st. - ILFA caught up with the new owners of the former 3D's space on the NE corner of Franklin and Sterling. They're aiming to open their Caribbean restaurant, Island Seas, in about a month, which will will be a "wine and dine" spot featuring jerk chicken, several varieties of fish, and "the best oxtail you've ever had." 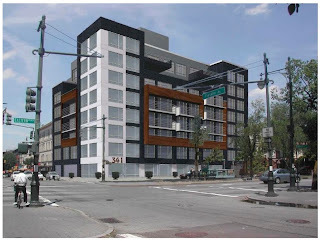 - Meanwhile, reader Damian reports that the long-underused space on the SW corner of Franklin and Sterling is getting a major makeover, with new walls and what looks like a restaurant kitchen going in. That location was used as storage for years, but it was only a matter of time before the owners decided to develop it. 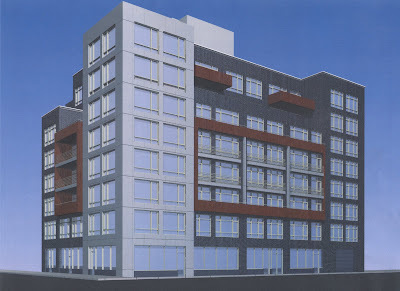 After four years of inaction at the corner of Eastern Parkway and Franklin, the lot at 341 Eastern Parkway has changed hands for $8,265,000. The new owners of the property are, according to the deed filed with the city yesterday, Eastern Parkway Partners LLC, a corporation that shares an address with BlueJay Management in Nassau County. BlueJay lists 341 Eastern Parkway as a "75,000 square foot residential development with a retail component" among their portfolio of properties "currently owned and managed." 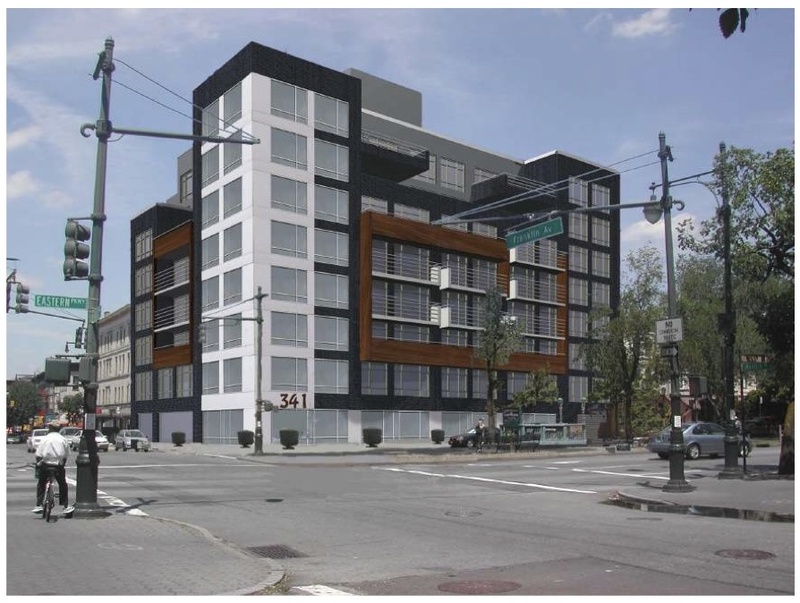 An image of what the development might look like (above) is available from IZ Design, the folks who designed the Classon, who list the property among their "current projects." Existing zoning regulations would require than any retail be accessed from Franklin, not Eastern (though the developer could make efforts to change that, as some retail is present on Eastern Parkway to the east). As for that sign from Pinnacle Realty, reports are that they represented the new owners in the sale of the property (though the realtor listed, David Junik, has nothing about the property on his own page) and that they are not connected with the infamous slumlord (for those keeping score, this ILFA post was wildly off the mark). We've had over 40 small business openings on Franklin Avenue since 2008, but this summer looks to be the summer of the big development. Readers, your thoughts? Ack - time has flown so fast over the last few weeks that I looked at the email from Art Not Arrests and CHCA and thought "oh, April 7, that's NEXT weekend." Not so much. So, if you're around right now or this afternoon for an hour or two, head on down to the Crow Hill Community Garden (Franklin between Sterling and Park) to help the folks from Ground Up Designers clean up and prepare the garden for this summer's installation, as well as build the actual frame that will hold the canopy of zip ties. 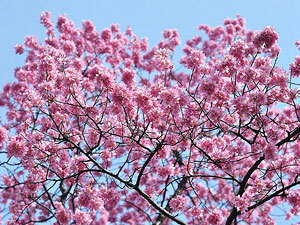 - The cherry trees are beginning to bloom at the BBG (see above), so put on your walking shoes and go for a stroll with that special someone this weekend (don't wait for the festival at the end of the month, which is always packed and, with global warming, always comes too late, anyway). To appreciate them even more, check out this fabulous story about the dirt the trees are planted in (here's a Brooklyn Dodgers connection) from Michael W. Robbins' collection Brooklyn: A State of Mind. - Tonight, check out Chef Benoit Bofia's SoulKofa Soiree at Lily & Fig for good company and a vegan African buffet. 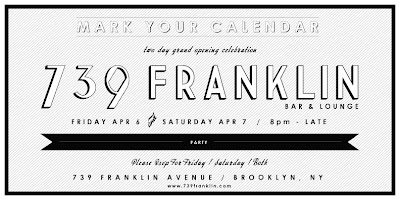 - Tonight and tomorrow, 739 Franklin offers food, music, and cocktails in their brand new space as part of their grand opening. - Finally, as regular readers will know, ILFA is a total map nerd. 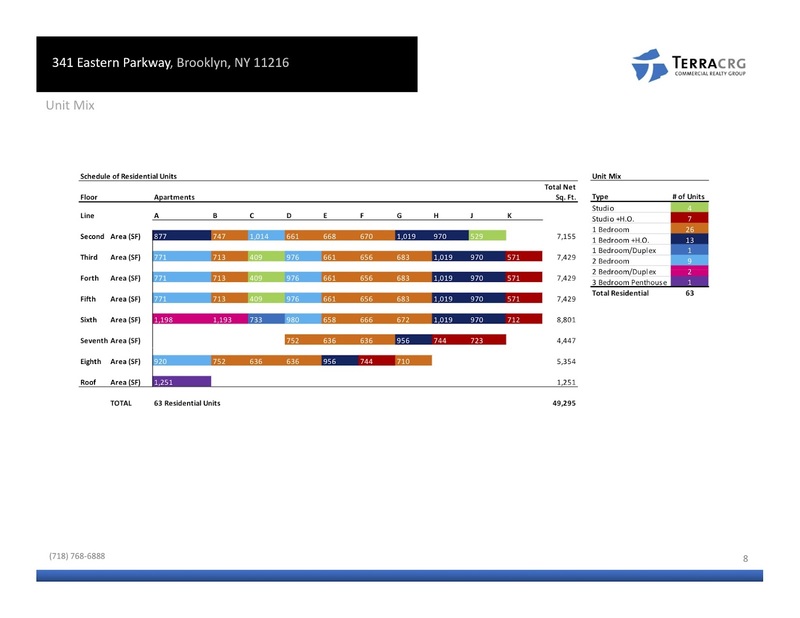 Check out this latest one from Columbia, an energy-use map of NYC. 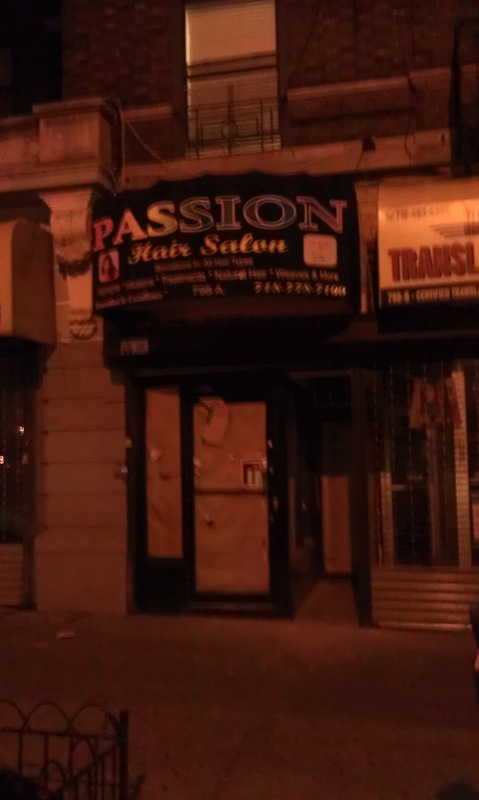 Straight from the rumor mill, ILFA has heard that the former Passion Hair Salon on Franklin between Eastern and Lincoln (798A, if memory serves) is being transformed into a falafel joint as we speak. Whenever they open, Gothamist will have to update their "Food and Drink Tour of Crown Heights" and the Daily News will have to update their "Guide to Crown Heights and the Brooklyn Botanic Garden," both of which were published in the last few days. Meanwhile, down the street, the clinic at Franklin and Park is getting a new mural, courtesy of Imaginal Disc Art. Finally, while it's not in Crown Heights, tonight's party for dance documentary Flex is Kings over on Bond and Union looks to be truly fantastic (and I know some local folks are involved in the project, so hey, there's your CH connection). 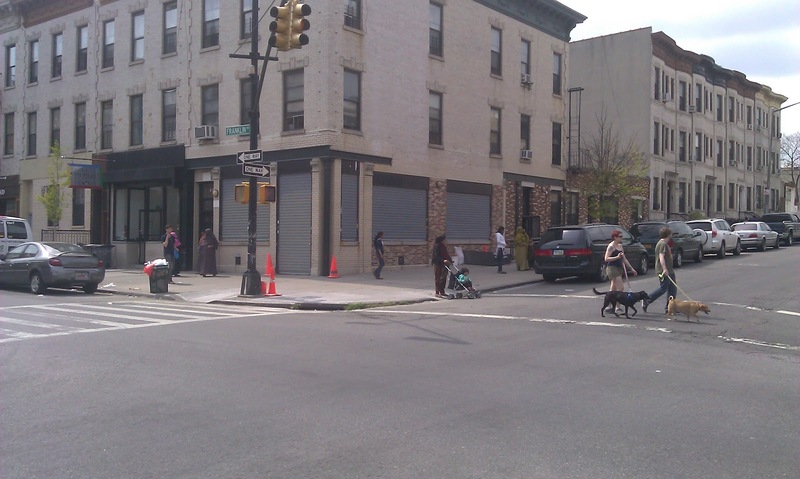 Years ago, a local developer turned an old Studebaker building in Crown Heights into low-income housing, an unlikely redevelopment that was hailed at the time for marrying preservation and affordable units. Today, it was announced by the Wall Street Journal that the other Studebaker building in the neighborhood, the former service station at 1000 Dean Street just west of the shuttle tracks, is also slated for a radical transformation. Jonathan Butler, the creator of real-estate blog Brownstoner and the Brooklyn Flea and a guy who knows about as much as one blogger can about the changing shape of Brooklyn neighborhoods, has put together a mega-deal to pour $30 million into three industrial properties along Dean between Franklin and Classon. The WSJ reports that much of the space will be used for "mixed-use office space to house a mix of small businesses like Internet start-ups, food makers and light industrial manufacturers," hopefully employing 400-500 people in a couple of years. (no word on how much local hiring is in the works). Additionally, Butler and his partners (who include Goldman Sachs and the guys who brought you the Toren) plan to set aside some space for good times. Writes the Journal, "one section of the property will be used for cultural events and another section will have a food and beer hall that will feature food vendors from the Brooklyn Flea, a flea market held on weekends in Fort Greene and Williamsburg. 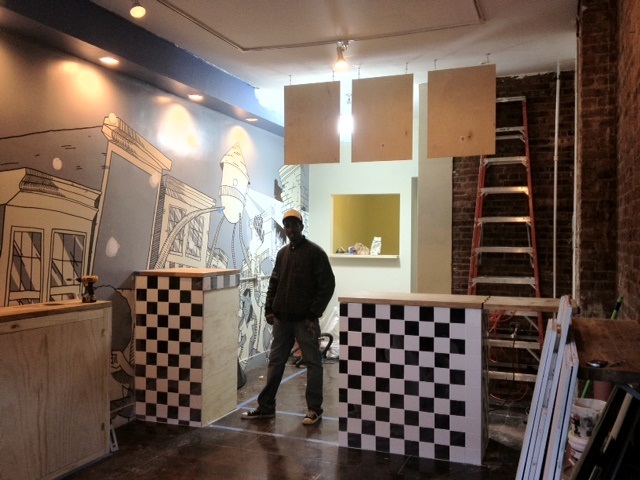 Mr. Butler envisions that the 9,000-square-foot food hall will have five or six different food vendors." 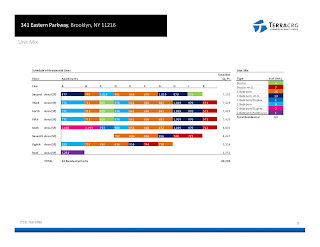 About 15 months ago, with new businesses including Thirst Bar and Compare Foods opening up in the area, Nostrand Park described the hitherto-light-industrial-but-starting-to-develop area bounded by Prospect, Atlantic, Washington, and Franklin as Four Corners (so named for its location, at the juncture of Crown Heights, Prospect Heights, Bed-Stuy, and Clinton Hill). At the time (as it does now), the area that still had many working junkyards, auto body shops, and live poultry butchers, but was also attracting wine bars, high-end residential development, and increasing numbers of creative-class types. With Butler's big-time investment getting under way this summer, one can only imagine that "Four Corners" will be turning a corner as all of these trends accelerate. Readers, any prognostications? 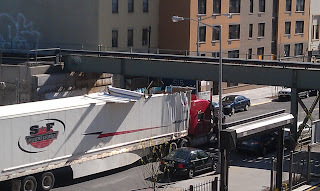 Thanks to reader Amar for sending these photos, which arrived in my inbox with the subject line "maybe time for a "maximum height" sign on the shuttle line bridges?" 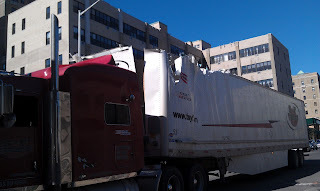 If, like Amar, you live nearby and woke up to a big bang this morning, this was it. The announcement says it all - 739 Franklin, the latest addition to the super-hot block between Sterling Park, opens for business this weekend with a two-day celebration. Swing by on Friday or Saturday for free (while supplies last) catered hors d'oeuvres and music (a DJ on Friday, and live jazz on Saturday), as well as first crack at their cocktails and other offerings behind the bar. 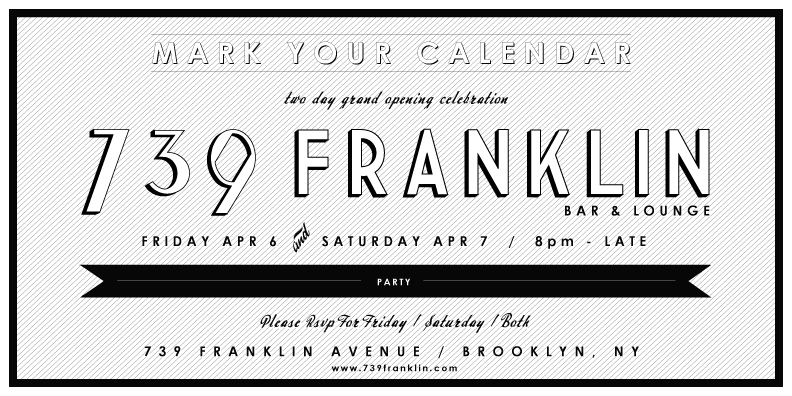 Should be a good time - the Franklin Avenue Merchants always know how to welcome a new spot to the Avenue in style. For those looking for an interesting Friday night, chef Benoit Bofia hosts his monthly SoulKofa Soiree this Friday, April 6, at Lily & Fig, featuring a vegan African buffet and eclectic company from 6-11pm. For more information, click on the flyer above or check them out on FB.